A friend of mine living in Las Vegas, (who I have to say hasn’t previously showed much sign of environmental sensitivities – we must be getting under his skin), sent me this picture the other day. The photo is of the rubbish created from a sit down meal at a restaurant. 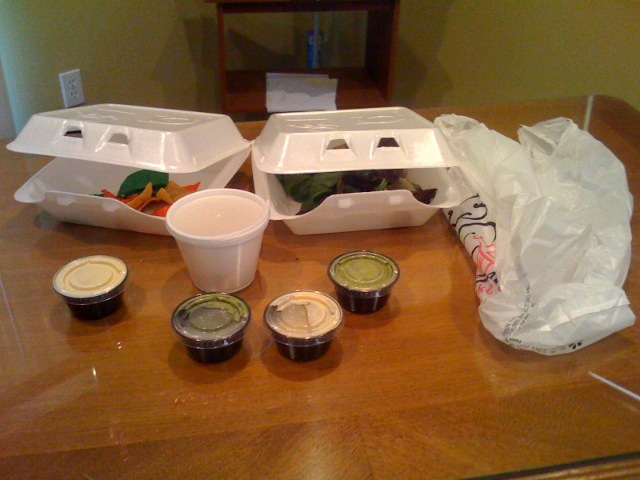 Styrofoam trays and cups, a plastic bag (presumably to get the meal from the kitchen to the table) and several small plastic sauce pottles. No doubt it is cheaper for this restaurant to buy disposables than to employ staff to do dishes. It happens here too, especially at cheaper places like food courts and of course fast food chains have been doing it since before I can remember. I often muse on how economics is the dominant ‘philosophy’ of our age, and how something can make no sense at all on social or environmental fronts but will be considered clever if it gives a player a competitive edge. Like USA and EU swapping millions of tonnes of almonds each year, EU almonds go to the States and Californian almonds go back to EU. This makes no sense, neither does over fishing or using Styrofoam for a half hour use and half a millennia disuse. There are many ways of challenging this destructive way of being, some more effective than others. Essentially this year Matthew and I are attempting to communicate something in a language well understood: money. Companies produce what sells well. If we buy the most ethical product then it will make economic sense for companies to produce the most most ethical product. Anyway! That was a bit of a rant! Thanks to all the people who gave us their dog food recipes, but the suggestion we most liked was buying dog food from Bin Inn. I have always marveled at how we can cook for half an hour, eat for 10 mins and wash dishes for another 10… meanwhile the dog’s dinner took 2 seconds to scoop, 30 seconds to eat and she leaves the bowl cleaner than when she started. It just seems a shame to complicate this beautiful routine. Jess wolfed down the new food last night so I guess thumbs up (paws up) for her. There was also quite a bit of discussion about what I should do with my underarm hair! Quite an odd thing to be discussed for me really, but so be it. While I am very happy with my ‘new’ old fashioned razor I do need new blades. I looked around unsuccessfully for blades, tried a couple of barbers etc. Finally someone said that I could buy them in a supermarket. How ironic. I assumed they were a rare novelty. Good news anyway. Heather of Avondale, Auckland asked about how we dispose of bones. We do eat meat but have relatively little issue with bones. This is because 90% of the meat we eat is red and most of that is stewing cuts and mince -without bones. If there are bones we put them in our organic bone destruction unit (Jess). Chicken and fish bones (which choke dogs) are put in our long term compost system. This is basically a hole in the corner of our back yard, which once full will be left for 5 or so years. It also has fur, hair, fingernail clippings and dog poo. Hope this helps. Apparently butchers used to take bones back off their customers because they sold their bones to a bone collection service. I believe this situation has now reversed, with butchers having to pay to have the bones collected. I assume the bones are still used for useful purposes, maybe you could even give the butcher money to take your bones – although I suspect they might look at you funny. Heather’s question, which was through the NZ Herald blog site, made me realise that if you have been following our year through the Herald, either printed or online you may not realise that we have a very comprehensive website: http://www.rubbishfree.co.nz. One of the features of the site is our Rubbish Free Guide. In it we have detailed all of the things we have done / are doing to be rubbish free. The site is also searchable. This enables people who have specific interests to easily see all on the site that relates. Finally (this has been a long blog…) we are delighted to announce that Bin Inn is now sponsoring us to be doing what we were doing anyway. We have been thinking over the months what a good little advert we were for Bin Inn (this blog is again case in point) and so we approached them, hoping that they would agree. Happily they did. Thanks Bin Inn! Its great to be working with you. Why do Binn Inn have a store in Wellington !!!!!!!! We have 2 boys (12 and 7)and have decided to take on the chalange -on a progresive basis. We are now down to 1/2 a rubish sack per week. With petrol so expensive It’s sad that the only Auckland Bin inn’s seem to be on the North Sure. Are there any in West Auckland? The kids have guinea pig re-cyclers. Fun for the kidsto play with and now there is an Auckland Guinea pig club with shows and prizes! Don’t have to mow the lorn! If you RE-USE a real estate sign in their nest box then cleaning them out is not so ‘icky’ and very good for mulching or the vegie patch! I have been wondering too, why they don’t have a Bin Inn in Wellington or Lower Hutt. And there doesn’t seem to be anything similar here. I have just had a look at their website and there doesn’t seem to be a ‘contact us’ option (although I may have just missed it) so we can’t even ask them that question. Maybe they might like to answer that question through this website? Firstly, apologies that we don’t have any Bin Inn Stores in Wellington. The closest to Wellington is our Masterton Bin Inn store. Likewise in Auckland we only have the two Bin Inn stores which are both on the North Shore being Browns Bay and Orewa. However we do have 37 Bin Inn stores nationwide from Kerikeri in the north to Invercargill in the deep south. All store addresses and maps are on our http://www.bininn.co.nz wwebsite or phone 0800 BIN INN(0800246466)to be automatically connected to your nearest Bin Inn. Again sorry for no Bin Inn stores in Wellington but we would love to open up a Bin Inn store in or near Wellington and also a few more Bin Inn stores in East, West and South Auckland. If you know anyone keen to be their own boss to own and operate their own Bin Inn store just send them my way. Email nhale@bininn.co.nz. And finally, Bin Inn is very proud to be sponsoring the Rubbish Free Year Challenge, Matthew & Waveney are doing a fantastic job of raising public awareness of reducing rubbish. Regarding bone disposal, in winter we put all meat scraps and bones in the log burner while the fire is going. Either they burn up completely or we are left with dry crunchy remnants which are easily crushed up when adding the ashes to the compost heap or directly to the garden. Thats awesome! Do you know if there are negative emissions effects from burning the bones? I would love a Bin Inn in Wellington, the only thing similar is Common Sense Organics which doesn’t have the range Bin Inn does and costs more!! We can hook you up with the right person if you want to start a Wellington Bin Inn! There are a lot of Wellingtonians missing out hey. If you don’t have a Bin-inn, check out the Indian stores For all your spices, seeds&nuts, dried fruits & products (tons of dried peas, beans,grains, rice, flours, tea, coffee, open chutneys, feta, olives, baking soda, you name it) . But even if there is one, there are very interesting and different stores. In Auckland there are haps of stores, 3 with the name KHYBER SPICE, but also others, especially in the Sandringham area but also in Avondale, in Newton Rd near the Mahama Ghandi Centre, in Royal Oak towards Onehunga (there is also a bulk store providing similar items as bin-inns), heaps in Stoddard Road, Mt Roskill. I remember that there were bin-Inns in auckland when we arrived in NZ in 99. The question is why people allowed them to disapear? Why was it so envouge to go to superexpensive Foodtowns and Woolworth other then to be hip and then moaning about the prices? I would never ever buy any veggies or fruit at Foodtown or any other supermarket – too expensive and not good enough quality for the price. If you look close, you won’t pay more in a deli!!! I go to fruit shops and Chinese supermarkets – often fresher and usually 1/3 less if not half price for certain items only!! BOYCOTT THE BIG SUPERMARKETS – WE REALLY DON’T NEED THEM!! Found your blog on Google and have enjoyed reading your posts. Nice work!